Will the Heat Break Up the Brothers Johnson? May 17, 2017 | by RotoRob | Comments Comments Off on Will the Heat Break Up the Brothers Johnson? 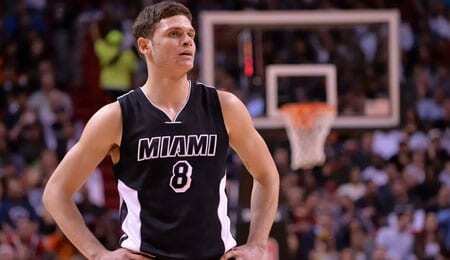 It was a disappointing season in Miami as the Heat slipped from being the No. 3 seed in 2015-16 to failing to qualify for the playoffs in 2016-17. But make no mistake — it sure wasn’t the fault of “The Brothers Johnson” — guard Tyler Johnson and (his not brother) forward James Johnson. And if you bet on that happening, our guess is you’ll fare quite well when you play here. Tyler, a third-year two-guard whose path to the NBA inspired a special (see video below), played exclusively off the bench this season for the first time, but became a real focal point of the second unit, getting to the line nearly twice as often as ever before and developing into a decent rebounder for a backcourt player. He missed a bit of time with a shoulder injury, and while you’d like to see more in the way of assists from him, Johnson proved a fine Fantasy asset capable of contributing in virtually every other category (although after averaging nearly a block in January, he normalized after the All-Star break, going down to 0.4 per game). The pair developed major chemistry off and on the court, and together really anchored Miami’s bench. James’ performance made him one of the top waiver wire additions among forwards this season (watch for more about that soon when we release our 2016-17 NBA Wire Troll All-Stars). While he spent most of his time as a starter in Toronto last season, this season just five of his 76 appearances came in the starting lineup, but that didn’t stop James from putting together a career season. His outside shooting touch was never better, and he got more points from the line by being aggressive and taking it into the paint strong. James even doubled his steal numbers from the previous season, so the improvements were not merely on the offensive end. If this pair is split up, it will definitely have an impact on Miami’s depth — the Brothers Johnson (not to be confused with the mid-’70s funk band) combined for 26.5 points, 8.9 boards and 6.8 assists. That’s a lot of bench productivity. In fact, both players recorded career bests in the three major categories. Tyler played well enough at times last year to offer promise that he can develop into a bigger force — good news for Miami considering he’s under contract for the next three years. While James isn’t exactly a star, he’s due for a very healthy raise, so the question is: does the retooling Heat want to dole out that kind of for a 30-year-old coming off a career season, or would they rather let Justice Winslow develop into a potential star? Still, James wants to return, and it’s conceivable he might even take less coin to re-sign with the Heat. Now it’s your turn. Let us know in the comments below where you think James Johnson will wind up. Posted in BASKETBALL, Free agents, RotoRob | Comments Off on Will the Heat Break Up the Brothers Johnson? After showing signs of breaking out in 2014-15, it’s pretty much been all downhill for the seventh overall pick from 2013. However, before we completely write McLemore off as a bust, it’s worth pointing out that lately he’s been jacking them up from downtown as a ridiculous pace, canning 9-of-15 from beyond the arc over the last two games. On Friday, he narrowly missed a double-double while adding four steals, and last week he showed signs that he could get to the line more often. Slowly, but surely, McLemore’s game is forming. Perhaps it’s worth picking him up to see if he’s simply a late bloomer.